Many modern phrases we use today have lost there original meaning and are now used in a different context. One of these is the term ‘skid row’, which usually means a poor dilapidated urban area. 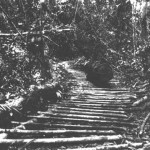 This phrase was originally used in the 19th century, in North America, to describe a road constructed from timber and used to remove trees from a forest. These timber roads were generally constructed on the slopes of hills and connected the forest to a saw mill or a river. 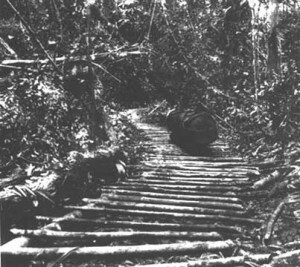 The timber sections forming the road way were usually kept continuously greased to allow large logs to slip down the roadway with ease. However during cold weather this wasn’t necessary as the frost was enough to keep the timber slippery. As a result the roadway then became know as a skid road or skid row. It was a clever, cheap way of moving large logs and took up relatively little space. When it no longer required it could be used to remove its own dismantled timber sections. The more modern meaning of the term skid row is a poor and dilapidated area of a town. A possible explanation for why this change of meaning occurred is that the skid road was normally located near sawmills which were noisy, industrial and dusty places. As a result these areas would contain cheaper housing and poorer households. Another more simple explanation is that once the forests were cut down, the saw mills and skid roads became redundant and the areas of town containing them became dilapidated. In a European context the term was made famous by the Irish rock band ‘Skid Row’ in the late 1960’s and early 1970’s. The band is famous for having Phil Lynott and Gary Moore of Thin Lizzy as members for a short time. Brush Shields was also a member. Does anyone know examples of other construction phrases which now mean something completely different?